Facebook continues to stuff features into Messenger, but this time it's to make all those other additions easier to find. David Marcus, Facebook's VP of Messaging, announced new Messenger tools at the company's F8 developer's conference in San Jose on Tuesday. It's part of the company's quest to make the chat app a central location for buying, sharing and playing. It still does old fashioned text conversations between humans, too. Facebook's vision for Messenger is similar to how popular chat apps in Asia like Line already work. 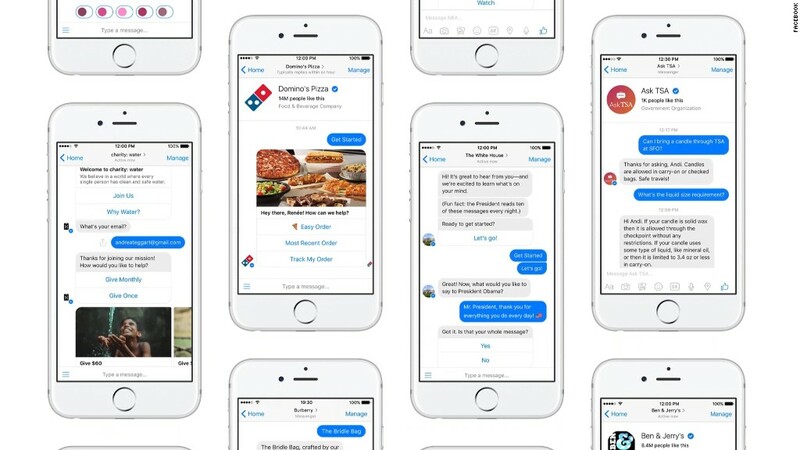 Last year at F8, Facebook went all in on bots. A bot is a program that automates one side of a conversation, usually between a person and a brand. You can start a chat with a jeans company and ask about a refund or new styles. A bot would automatically reply, make fashion suggestions, even let you buy the latest denim inside the app. Facebook (FB) and Microsoft (MSFT), which added bots to Skype, talked about this text-based technology as if it would change lives. Now the bots have been built (more than 100,000 for Messenger at last count) and most lives are ... pretty far from changed. So for now, Facebook is focusing on making Messenger easier to navigate. It's adding a new area called Discover where you can browse different Messenger tools, bots, apps and brands. There's also a new tab just for games. Multiple people can now add a bot to a conversation. If you're talking about music with a pal, use the Spotify bot to play a song in the chat. Called Chat Extensions, there are already apps for Spotify, Open Table, Kayak and the NBA. Then there's Facebook's own bot, M. First launched to select users as the smart assistant of the future, M finally rolled out to all users last month as a pretty basic chat bot. It monitors your Messenger conversation for cues and chimes in with suggestions. Starting Tuesday, it is adding food delivery, so if you say you're hungry, it might suggest to order some munchies through Deliver.com. Companies, which are hoping bots can help automate customer service jobs, are getting new tools too. Messenger is rolling out its own Snapchat-like custom QR codes for the real world. Companies can add one of these images to a photo, flier or ad. Point a phone's camera at the code and it will launch the related bot. Small businesses without budgets for bot programmers can play too with a new Smart Replies tool. It turns a company's frequently asked questions, like hours and location, into automatic replies on Messenger.